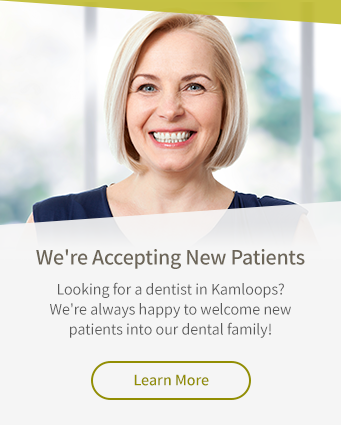 The dentists at Cedar Dental Centre in Kamloops are proud to offer Invisalign® clear, custom orthodontic aligners as an alternative to traditional metal braces. You don't need braces to straighten your teeth. With Invisalign's clear aligner system, you can achieve a straighter, more even smile without metal braces. Invisalign's smooth, transparent plastic aligners are comfortable, removable, and almost invisible. Invisalign treatment consists of a series of removable, custom-made, clear plastic aligners that are changed out weekly or bi-weekly. Each set of aligners makes tiny adjustments to your teeth, until the final results are achieved. Treatment duration varies, and is comparable to that of fixed braces. You can remove your Invisalign® trays to eat, drink, and to brush and floss your teeth. This means fewer dietary restrictions, and fewer changes to your daily routines. The cost of Invisalign treatment varies depending on patients' individual needs. Factors like the shape of your jaw, the amount of movement required to correct your misalignment issues, and the combined misalignment of your teeth and jaw may affect the duration of your treatment, and therefore the number of aligners you'll need. This, in turn, will determine the ultimate cost. The only way to find out for sure how much your Invisalign treatment will cost is to talk to your dentist. Invisalign® can correct a variety of misalignment issues, including teeth crowding, wide spacing, open-bites, under-bites and cross-bites. Invisalign® has become an increasingly popular treatment choice for both adults and teenagers because of the flexibility of treatment, and its low-profile appearance, but it is not the right choice for everyone. Consult with your dentist to find out if Invisalign is the right choice for you.